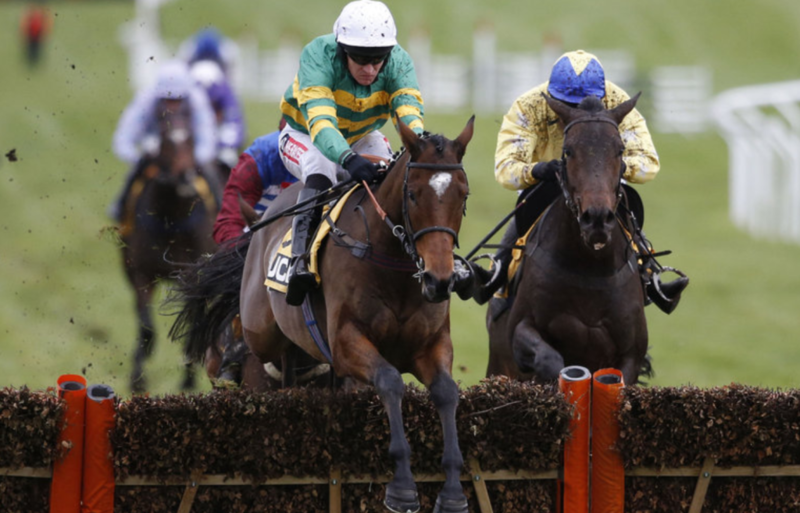 DEFI DU SEUIL overcame a few untidy jumps in the home straight to power away from his four rivals at Chepstow and justify odds of 4-5. Stretching his unbeaten record with Philip Hobbs to four, the leading Triumph Hurdle hopeful gave his supporters a few nervous moments as he jumped the final three flights but was never threatened otherwise. In the end, the winning margin was a yawning 13 lengths, with the highly regarded Evening Hush the best of the rest in second, having been sent off at odds of 5-2. 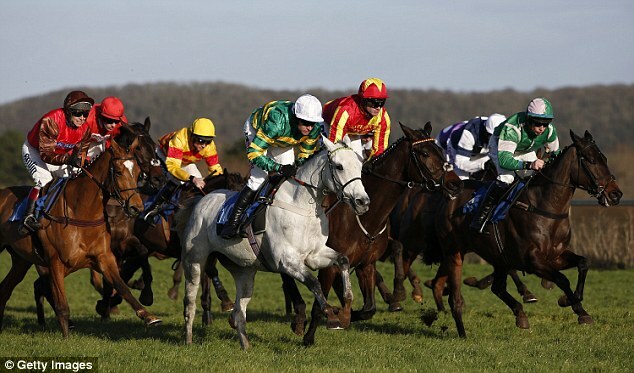 Winning jockey Richard Johnson said: « He’s very good and I was pleasantly shocked at the way he picked up turning in. If we had a wet spring he would take a lot of beating against the top juveniles. « I lit him up and got him there to soon, but down the back straight his jumping was really good. 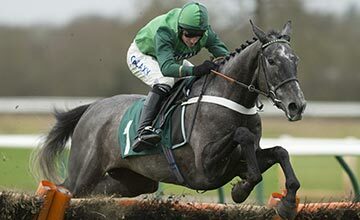 He was a bit clumsy and green up the straight but he’s a very good jumper and has done it really well. 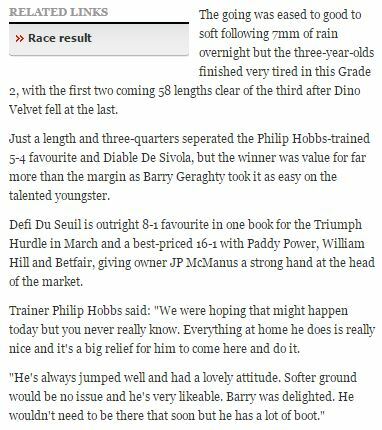 » Hobbs added: « He was very impressive and the only minus was his jumping up the home straight, which was appalling and he is usually brilliant. Maybe he was in front for a bit too long. Evan Williams, trainer of the runner-up, had high praise for the winner and said: « Our’s is a good one and he destroyed us. No complaints, he beat us fair and square. We’ve run a blinder but this one is a machine, no mistake. He’s brilliant, we’re just very good. « We’ll look at Cheltenham in January or the Adonis. 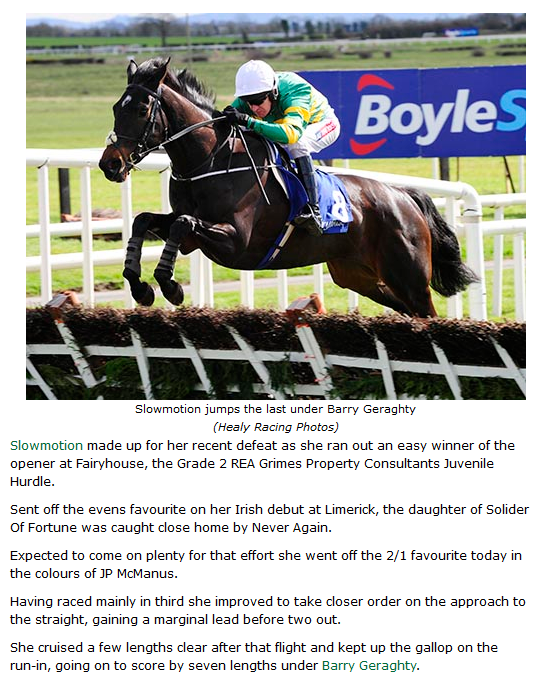 She’s good enough to win a Grade 2. » Paddy Power responded to the win by shortening Defi Du Seuil from 6-1 into 3-1 favouritism for March’s Triumph Hurdle at the Cheltenham Festival. 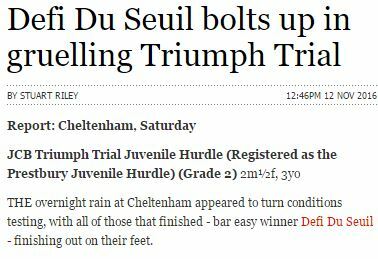 10 dec. 2016 – THOUGH he was landing cramped odds of 4-6, so taking was Defi Du Seuil in landing the JCB Triumph Hurdle Trial at Cheltenham on Saturday that he moved up to challenge Landofhopeandglory at the very top of the betting for the real thing in March. 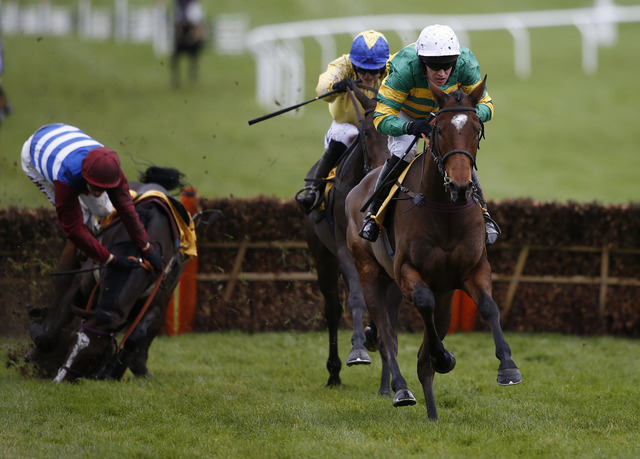 Paddy Power and Betfair were most impressed by Defi Du Seuil, both making him their 6-1 joint-favourite with Landofhopeandglory, another McManus hopeful in the care of Joseph O’Brien. The race was the sort of muddling affair that so many similar races descend into, with only Candy Burg’s pulling himself to the front lifting the tempo to any serious degree. 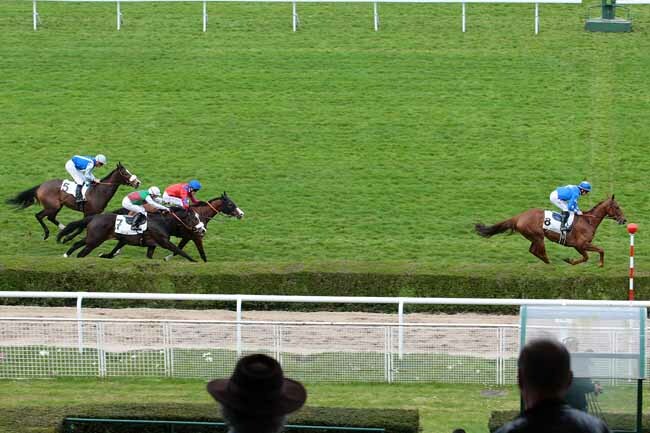 All five were still in contention approaching two out, but a mistake by Domperignon Du Lys ended his challenge and by the last it was clear that the winner and Coeur De Lion had it between themselves. The runner-up pulled nine lengths away from the third, impressive in itself, but Barry Geraghty on Defi Du Seuil obviously had him covered and just rode out his mount after a check under his other arm. Tom Scudamore said he felt his late grandfather Michael was with him as he snatched victory on the line over the Grand National fences aboard David Pipe’s Vieux Lion Rouge in the Betfred Becher Handicap Chase at Aintree. And now Scudamore and the seven-year-old’s connections are dreaming of glory in the Randox Health-sponsored Grand National back at Aintree Racecourse in the spring. Everton FC fan Scudamore, who is yet to win the Grand National, was scoring for a second time over the big Aintree obstacles having landed the Grand Sefton Chase aboard Pipe’s Poole Master two years ago. Scudamore’s grandfather Michael, who died two years ago, did win the world’s greatest steeplechase aboard Oxo in 1959 and it was emotional success for the leading rider back at Aintree. And after an typically action-packed contest the current rider in the Scudamore dynasty managed to get 8-1 favourite Vieux Lion Rouge up on the line by a short head to deny Jimmy Moffatt’s Highland Lodge (20-1) back-to-back victories in the 3m2f feature race. Under Henry Brooke Highland Lodge was always prominent but was just denied by the fast-finishing Pipe charge, who had been seventh to Rule The World in the National back in April. This year’s Grand National runner-up The Last Samuri (9-1) was a length back in third place, with Gordon Elliott’s Ucello Conti (10-1) fourth. Now Vieux Lion Rouge will bid to give Pipe a second Grand National victory after Comply Or Die’s success in 2008. Having run well in last season’s race and landed the Becher, Pipe is already planning for a return to Merseyside on April 8 in the new year. 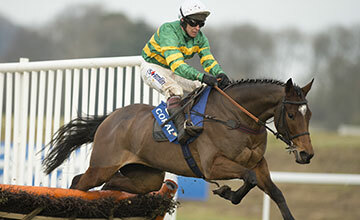 He was pushed in to 20-1 joint favourite alongside The Last Samuri and Empire Of Dirt by William Hill. 32 Red were offering 33-1, while The Last Samuri is as low as 14-1 favourite with bet365 for the National. The Pond House handler Pipe said: « This has obviously been the plan for a while, but I wasn’t sure he was going to get there. « Once Scu bagged the rail at the elbow then I felt like he’d get up and he responded well. « He ran a brilliant race in the National (seventh) but he’s only seven and he didn’t quite get home, he’s a stronger horse now. 30 nov. 2016 – The 4 years old Laissez Dire wins first time out in the UK on Catterick racecourse, for his new owner JP Mc Manus and trainer Alan King. He won easily a beginner’s chase facing older horses. Laissez Dire is a purchase advised by HRA to the Mc Manus team after 2 wins at Pau last winter for French trainer Guy Cherel. Brelan d’As was an impressive winner at Wincanton on November 17th, an other purchase advised by HRA for the McManus team at the French Arqana Automn sales 2015. 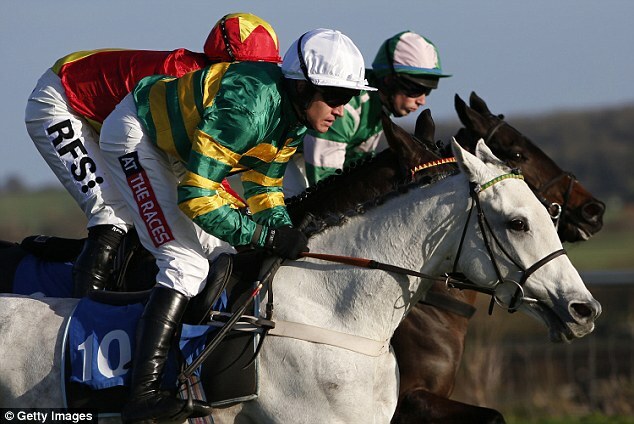 DEFI DU SEUIL won a Group 2 in Cheltenham and remains unbeaten in the UK for his new colors of Mr. JP McManus. He is a purchase advised by HRA for the McManus Team. 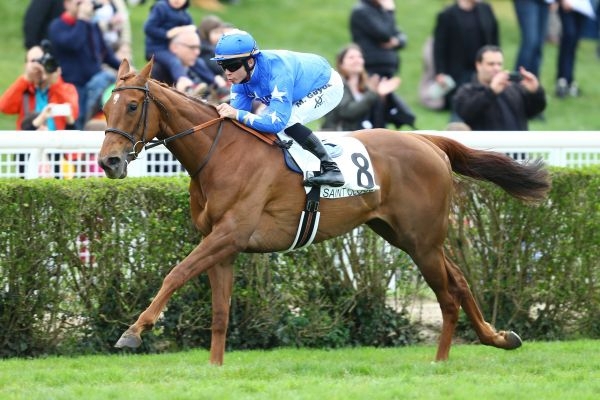 MARYPOP does not stop improving and won her Listed Race on April 3rd, very easily by a comfortable 3 lengths in Saint Cloud (FR) over a mile and 2,5 furlongs. The style of the victory is very pleasant and full of promesses for the future. MARYPOP was purchased privately last year for Wood Hall Stud. SLOWMOTION won easily a Group 2 for the second time out in the UK wearing her new colors of Mr. JP McManus (March 28th). A purchase advised by HRA for the McManus Team. 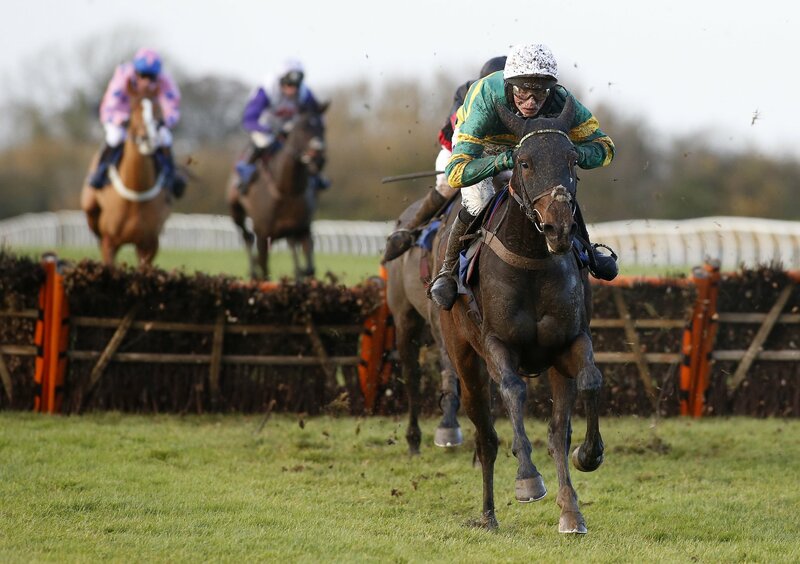 BLOODY MARY impressed and won yesterday at Taunton over hurdles for her first time out in the UK and for her new green and yellow colors. This was the first runner, and first winner (! 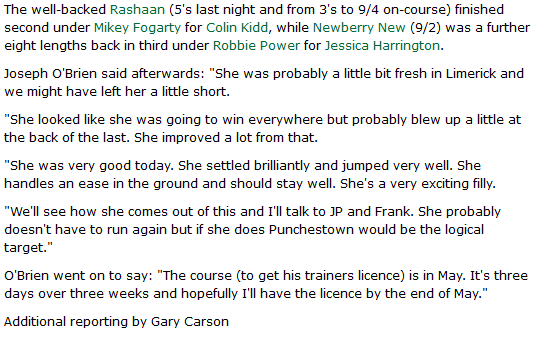 ), of a purchase advised by HRA for the McManus Team. Paddy Power cut Bloody Mary to 10-1 from 14s for the new Festival race. FIXE LE KAP was selected by Horse Racing Advisory at Arqana Automn sales for 12.000€.